One of the perks of being a photo instructor at the Kalamazoo Institute of Arts (KIA) is being able to exhibit my work in the biennial KIA Faculty Review. I'll be showing two portraits in the upcoming exhibit: one is "Lois and Tree Frog" from my series MYANIMALANDI (which I premiered at the Arts Council last Spring), and a brand new artwork from a new series entitled BLOOM. 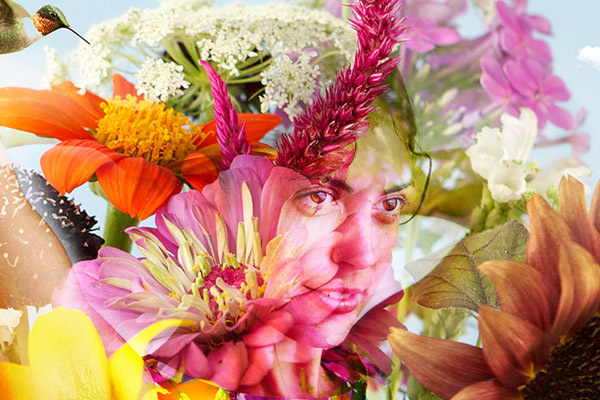 Very similar to the people/animal collages of MYANIMALANDI, this new work collages women and flowers. Thus comes the bloom. This exhibit marks the first public viewing of this new work. Please join me either this Friday, September 27th for the KIA Members Opening Reception from 7-9pm, or the following Friday, October 4th, for the KIA Art Hop from 5-8pm, which is free and open to the public. Below is a detail from the new work, "Miranda In Bloom". Come see the entire artwork at the KIA!